Students at the university where I teach are, for the most part, willing to suffer (at least a little) for the sake of the environment. In support of campus efforts to “go green,” many students report taking shorter showers than they took at home as high schoolers. Most struggle, uncomplaining, to balance plates and glasses in the dining hall; getting rid of cafeteria trays has resulted in both lower water consumption and less food waste. Members of a student-led group, Earthkeepers, haul the food scraps we do produce to a designated area behind the Science Center and, months later, transport compost to the campus garden. A number of these students find fuel for their resolve in the writings of Kentucky poet-farmer Wendell Berry. One of my teaching colleagues, who has supplied some of these environmentalists with plenty of Berry, recently bemoaned his inability to remember the title of a particular essay he wanted to assign. After a while, he said, they begin to run together, and he’s not sure whether Berry really wrote the piece or if he thought up its central idea himself—under Berry’s influence, of course. Phillip J. Donnelly makes a similar point in “Biblical Convocation in Wendell Berry’s Remembering,” writing, “Whether we consider Wendell Berry’s poetry, his fiction or his essays, the remarkable integrity of his writing can make it difficult to discuss one aspect of his work apart from the whole” (275). Donnelly asserts, for example, that “Remembering is more effective than Berry’s nonfiction prose in challenging Christians to responsible stewardship of creation” (292). While I am eager to introduce my students to Berry’s insights on creation care, I also want them to learn from his observations about human relationships. To that end, I regularly teach Jayber Crow (Counterpoint, 2000). While several of Berry’s other novels would probably serve my purposes equally well, I justify my selection with Berry’s own affirmation of his 2000 novel. When Harold K. Bush Jr. asked Berry (who has authored more than fifty books) which of his works gives him the most satisfaction, Berry replied, “[I]f someone asked me what novel to start with, I would say Jayber Crow. I don’t think I can write any better than I was writing in Jayber Crow. The essays, some are better than others, pretty clearly, some that stick out in my mind; but they’re all occasional work, written to have something to say…. I like the fictions best” (221). 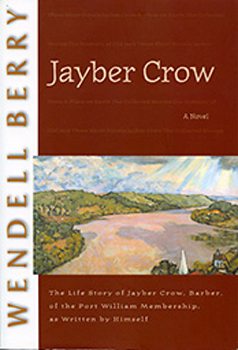 As love stories go, Wendell Berry’s Jayber Crow is pretty strange. The title character, an introverted, balding ­bachelor-barber, watches as Mattie Keith Chatham, an attractive neighbor-girl, grows up; marries a local basketball star; bears, rears, and begins burying their children; ages; and dies. One of my more cynical students, disturbed by Jayber’s fascination with someone so much younger than he, described him as a stalker. Used to romances in which the boy gets the girl, or vice versa, this student and some of the others with whom I’ve read Berry’s novel don’t know what to make of it. I have to work hard to convince some of them that Jayber is not a stalker but a suffering saint. In this sense, the novel Jayber Crow is a passion narrative. My students understand passion as we most commonly use that word. The Oxford English Dictionary defines “passion” as “Strong affection; love. Formerly also plural: [meaning] amorous impulses or desires” (OED def. 8a) and “An aim or object pursued with zeal; a thing arousing intense emotion” (OED def. 8b). Certainly, Jayber feels romantic desire for Mattie, and he pursues her zealously. Such devotion is indeed a form of passion, even if the two characters never share as much as a kiss. Jayber Crow is, however, a passion narrative of another kind: “the narrative account of the suffering and martyrdom of a saint; a martyr’s legend. Occasionally: (in extended use) any narrative life or legend” (OED def. 2b). Granted, Jayber doesn’t experience literal martyrdom; he doesn’t die for his religious faith. But from the perspective of most twenty-first-century readers (especially the perspective of most college students), he might as well have: he makes and keeps a vow of celibacy for Mattie’s sake. When he realizes that Mattie’s philandering husband Troy will never be faithful to her, Jayber breaks off with Clydie, his own good-time girl, and vows to be the husband Mattie deserves, even though his vow will likely always run one way. As Jayber’s unrequited passion for Mattie grows, so does his compassion—his participation in the sufferings of all his neighbors. Berry shows romantic longing to be a starting point not only for a far more encompassing human love but also for salvation itself. In this way, Jayber Crow recounts its protagonist’s progression toward sainthood. Jayber compares himself to Bunyan’s Pilgrim and Dante in the Commedia, calling himself “an ignorant pilgrim, crossing a dark valley,” and, like those two literary characters, he is journeying toward Heaven (133). He tells readers, “This is a book about heaven” (351), and he recounts his own preparation for going there, although he says that he didn’t always know that’s what it was while he was in the midst of it. Jayber further resembles Dante, the Commedia’s author and narrator-protagonist, whose early glimpse of the girl-child Beatrice influenced his life ever after. Jayber recounts that when he was twenty-four, he first noticed the fourteen-year-old Mattie Keith, whom he comes to declare the proper “end” of his life (29). In pursuing Mattie, much as Dante pursued Beatrice, Jayber ends up pursuing Paradise. In this regard, the novel’s romantic plot, unconventional though it may be, is theologically charged. A brief look at Charles Williams’s theology of romantic love reveals the plot’s significance and helps me advance my argument with students. Williams, an early ­twentieth-century Dante scholar who wrote poetry, fiction, and drama of his own, was a profound influence on his fellow-Inklings, C. S. Lewis and J. R. R. Tolkien, as well as on T. S. Eliot, W. H. Auden, and Dorothy L. Sayers. Williams asserted that the experience of romantic love is excellent preparation for knowing God—for entering heaven. In glimpsing the Beloved’s full potential, his or her glory, the Lover has the opportunity to see that all humans bear glory. Ideally, the recognition process will lead the Lover to the Source of that glory, the Creator God. In his study of Dante’s illustration of this phenomenon in the Commedia, Williams explains that “the record of the Dantean Way begins with three things—an experience, an environment of that experience, and the means of expressing that experience” (11). If all goes well, the process results in what Williams calls “the inGodding of man” (11). 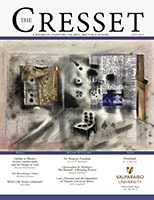 “‘To fashion this ability’,” Williams warns, “is a personal, secret, and arduous business” (13). Wendell Berry illustrates this painful progression powerfully in Jayber Crow and reveals the purgatorial possibilities within romantic love. Jayber suffers as he moves toward glory—partly because he loves but cannot live with the married Mattie, but also because his love for her attunes him to her suffering and to that of their neighbors in Port William, Kentucky. His heart stretches to encompass her and those she loves, and he becomes faithful to God as he lives out his faithfulness to Mattie. Jayber’s “experience” of his Beloved begins less dramatically than Dante’s did of Beatrice: Jayber says that his first memory of Mattie was of “a neat bright, pretty, clear-spirited girl,” kind to her peers and well-regarded by them (134). At first, Jayber simply wishes her well, just as he does the other young people who pass by his barber shop. He comes to feel protective of her, however, and wary of Troy Chatham, the handsome high schooler who courts her. Jayber realizes the extent of his ­interest in her two years later, when he is outraged by Troy’s proprietary manner with Mattie. On that occasion, Jayber reminisces, “[s]he was wearing a simple short-sleeved cotton dress, a white dress with little flowers on it. Her hair was tied back a little way from her ears with a ribbon. She was perfect” (138). Similarly, Williams writes of Dante’s vision of Beatrice: “A kind of dreadful perfection has appeared in the streets of Florence; something like the glory of God is walking down the street toward him” (20). Although Jayber’s vision of Mattie is not as theologically charged as Dante’s of Beatrice, her presence has initiated a similar process. This passage provides my students and me with plenty of conversational fodder, especially since much of their objection to Jayber’s interest in Mattie results from the characters’ age difference. Learning about the Dantean precedent helps them suspend their disapproval, if only briefly. Later in the book, Jay recounts his youthful struggle to envision his own future and concludes that Mattie was that future. “[M]y future,” he explains, “as it turned out, proved to be elsewhere. I hadn’t even glimpsed it yet. I had imagined no future. Who she was who would have my heart to own I had not imagined” (62). Later still, describing his attempt to comfort a grieving Mattie at her young daughter’s grave, he recounts kneeling “beside her, according to my calling in this world” (207). While such a focus on another human being may seem at first to be obsessive, even idolatrous, Berry depicts Jayber’s love as deeply life-affirming. Rather than closing Jayber off to others, as romantic obsessions usually do, or to God, as idolatry does, loving Mattie stretches Jayber’s capacity for loving others in Creation as well as the Creator, just as Williams asserts the best form of romantic love should do. Having Mattie, however unconsciously, lead Jayber to loving their neighbors illuminates the “environment of [the] experience” that Williams sets forth as romantic love’s second element. Moreover, it also enables Berry to develop a theme common to his work: that of the importance of community. In Jayber Crow, as in Berry’s other Port William novels, the Kentucky hamlet is the almost-idyllic alternative to contemporary communities in which people fail to forge lasting ties. In The Corrosion of Character, Richard Sennett bemoans the decline of the kinds of stable communities where members of extended families live out their lives and contrasts them with the cities and suburbs in which most upwardly mobile North Americans now live. “Such communities are not empty of sociability or neighborliness,” Sennett observes, “but no one in them becomes a long-term witness to another’s life” (quoted in Meilaender 210). Individuals who live in such places seldom have the opportunity to benefit from a healthy “experience of long-term, narrative time in fixed channels” (212). Although Berry also uses his novel to show the threat suburbanization poses to Port William itself, his account of Jayber’s long life there, a life spent as a “long-term witness to [Mattie’s] life,” illustrates the human capacity for and the worth of long-term narratives. Offering his narrative of Mattie’s life to readers enables Jayber to reach the third stage in Williams’s progression of romantic love: expressing his experience of the Beloved. Less dramatically and more obviously, however, Mattie helps keep Jayber in Port William. Orphaned twice in boyhood, first by his youthful birth parents and then by loving foster-parents, Jayber has no blood ties to the area. After growing up in an orphanage and attending college on a scholarship, he ventures to the big city: Lexington. Although he at first enjoys his urban anonymity, Jayber grows lonesome. Pulled by his memories of his foster parents and by a more recent encounter with another kind man from Port William, he makes his way back. He happens into becoming the town barber and, later, the church janitor and gravedigger. As a lifelong bachelor, he remains on the community’s fringes, but loving Mattie helps him forge nearly invisible but nevertheless strong ties. As my students and I trace Jayber’s own image of the tree, we can see how his love for Mattie serves as a taproot in his life while his growing connections to others secure and nurture him further. Among those unexpected happinesses is the satisfaction Jayber takes in making barbering house calls when Mattie’s father, Athey Keith, suffers a series of strokes. After shaving Athey, Jayber often sits with him and the rest of the family—except for Mattie’s husband Troy, too wrapped up in his business to join them—telling stories and sometimes eating supper together. Jayber later remembers this period in his life as “a sort of family membership” (267) and “with the family I would most have chosen if I had had the choice” (265). During these visits, he becomes particularly close to Mattie’s son Jimmy, of whom, he says, “the two of us together made Athey a sort of son-in-law come lately” (265). Later, after Jimmy’s death, Jayber unselfconsciously takes his place with the family at the cemetery. He recounts, “When they had assembled, instead of standing well out of the way as I usually did, I took off my hat and stepped in under the edge of the tent” (293). “Of course,” he acknowledges, “I had no more right to stop and grieve than anybody else. For a while, though, I felt that I too was being unmade by grief. Grief and bewilderment…. I could not imagine him dead without grieving, or without imagining his mother’s grief, which made me grieve” (294). Jayber’s strange membership in the Keith family, then, brings grief as well as joy, suffering as well as delight. He remembers his mixed emotions in response to Athey’s decline, explaining that “to have [Mattie] feel free to ask me for help was freedom itself,” while acknowledging the strangeness of having “Athey’s growing weakness… [bring] forth a kind of pleasure to me, but it did. That grief should come and bring joy with it was not something I felt able, or even called upon, to sort out or understand. I accepted the grief. I accepted the joy. I accepted that they came to me out of the same world” (264). As his heart expands to encompass Mattie’s family members, Jayber comes to understand his “membership” in the Port William community—a membership that brings him joy but that he must secure through suffering. Fairly early in the novel, shortly after he begins noticing Mattie, he resolves “‘to share the fate of this place. Whatever happens to Port William must happen to me’” (144). When the community begins to lose its sons in the Second World War, he discovers the cost of that commitment as he joins his neighbors in grieving. “[M]emories were kept,” he says, “stories told, and everything funny treasured up and spread around…. I don’t believe that grief passes away. It has its time and place forever. More time is added to it; it becomes a story within a story. But grief and griever alike endure” (147–8). In enduring his community’s grief and becoming one of its leading story-tellers, Jayber comes to love it more deeply, just as suffering with Mattie and giving witness to her life deepens his love for her. Jayber’s allusion to and appropriation of John 3:16—“that God so loved the world that He gave his only begotten son”—suggests the degree to which he identifies with God—the “inGodding” Williams describes. Ultimately, Jayber finds the grace to forgive and love even Troy, whose callousness toward Mattie and toward the parts of Creation entrusted to him has rankled Jayber for most of his life. Troy has squandered what Jayber sees as “the best opportunity of his life, which was to love, honor, and cherish [Mattie]” (338). Having been tormented by envy, Jayber confesses that he has even wanted to cut Troy’s throat as he sat in the barber chair (195, 342). Mattie, however, loves Troy, and her love makes Troy a part of the web in which Jayber lives, the membership of Port William. In the end, Jayber recounts, “[Troy] was redeemed, in my eyes, by Mattie’s long-abiding love for him, as I myself had been by my love for her” (361). That process, as Berry shows in Jayber Crow, entails suffering, but it is suffering unto salvation. 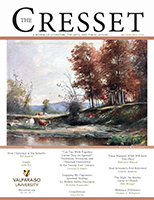 Bush, Harold K., Jr., “Hunting for Reasons to Hope: A Conversation with Wendell Berry.” Christianity and Literature, 56:2 (Winter 2007): 215–234. Clapp, Rodney. “What Hollywood Doesn’t Know About Romantic Love.” Christianity Today. 3 February 1984. Donnelly, Phillip J. 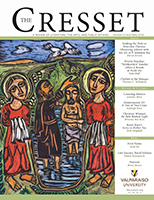 “Biblical Convocation in Wendell Berry’s Remembering.” Christianity and Literature, 56:2 (Winter 2007): 275–296. Meilaender, Gilbert C., ed. Working: Its Meaning and Limits. Notre Dame: University of Notre Dame Press, 2000. Sennett, William. The Corrosion of Character: The Personal Consequences of Work in the New Capitalism. New York: W. W. Norton, 1998. Williams, Charles. The Figure of Beatrice: A Study in Dante. New York: Noonday, 1961.